The first time Ghost remembers running was also the scariest moment in his life. When his father got violent and started shooting, he and his mom ran as fast as they could. Years later, Ghost has the opportunity to run again. This time, his dad isn’t in his life. This time, it’s not for survival. This time, it’s on a team of other talented runners. Ghost knows that he’s got what it takes to be great. Even as a new member of the team, he’s already one of the best. But he wonders if he could really belong on the team. After all, he lives in a different neighborhood than the other kids on the team. He doesn’t have any fancy running clothes or shoes, and he has a long record at school of all the times he’s gotten in trouble. Plus, he still carries around the haunting memories of that night when he first ran. No matter how fast he learns how to run, he’ll never be able to outrun that. 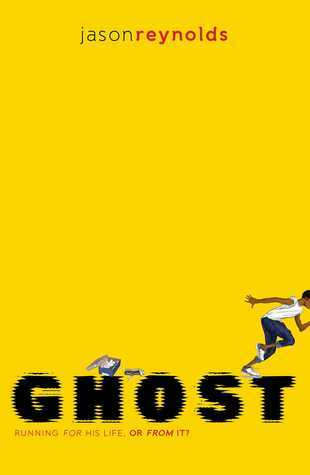 Ghost is a fabulous read that includes the excitement of sports along with the life-changing effect that being a part of a team can have on a troubled kid. Interestingly, the entire book takes place before Ghost ever runs his first official race. Instead, the book is about Ghost finding his place on a team for the first time and developing the discipline within himself that any sport requires to train his body and his mind to be as successful as he wants to be. Even without the descriptions of competitions, this is a high-interest book and could be interesting to those who have a previous knowledge of sports or those who do not. Parents should note that, though there is delinquent behavior in the book, it is not presented as honorable, and the character makes proper restitution for his actions before the end of the book. Though Ghost struggles with his impulsive behavior, it is not glorified, and is instead shown as something that holds him back from his goals.